Itsa Food Ltd are the proud owners of two revamped horseboxes that are EHO approved located in 2 high footfall areas in Kildare Village Outlet Mall. The project is aimed at providing a food residency to smaller operators for a period of up to two months in both the Breezeway and OakTree Way in Kildare Village Outlet Mall so that they can maximize and showcase their brand and products to the destination customer in Kildare Village Outlet Mall in Nurney, Co Kildare. We are providing the horse boxes for operators for agreed periods, trading hours are Kildare Village open til closing hours. They are available to rent individually. Light Blue in colour, this horse box is located in the Breezeway beside So Collective and provides covered seating area. Water mains and electricity are included with a Coffee Machine, Boiler and Grinder in place also. Two Under-counter Fridges, hand-wash sink and utensils sink, Fly Killer and a Micros till and Credit Card Machine are supplied. Green in color, this horse box is located in the Oaktree Way opposite Tommy Hilfiger with outdoor seating area provided. Water is self-contained through containers which can easily be filled by a close by location. Electricity is supplied. An under-counter Freezer and fridge is provided although if there is no requirement for a freezer this can be replaced with an additional under-counter fridge. Hand-wash sink and utensils sink, Fly Killer, Micros till and credit card machine are also supplied. 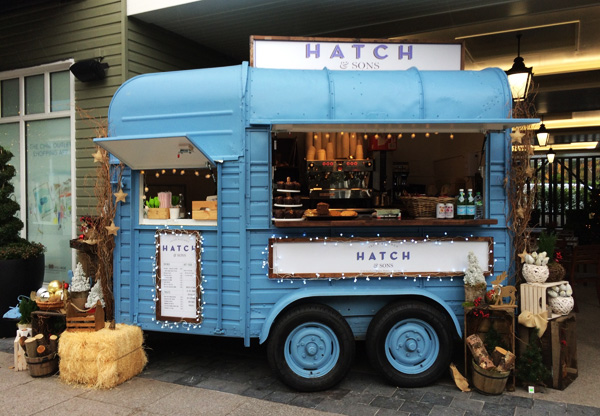 This horse box is ideal for a retail offer or cake/sandwich offer due to the nature of the water. What costs are involved and what’s provided? Storage unit: You share storage unit with Joe’s Coffee which is locked and under 24-hour security. Support: You are provided with support from management at Joe’s Coffee and training on both the micros, credit card and equipment on each horse box. Security: You will be provided with a set of keys for the storage unit and horse box, locked safe for your money. Signage: €150.00 for signage in Horse Box 1 and €200.00 for signage in Horse Box 2 (See individual Horse Box information for signage dimensions. The operator must provide the graphics and Itsa will co-ordinate the printing of the signage. Electricity and Water: Electricity is included in the commission and Horse Box 1 is supplied with Mains water and Horse Box 2 is standalone water with containers available to be refilled as needed. Credit Card Charges: There is a 2% credit card transaction charge on all credit cards. Restrictions: No Food preparation is allowed on site; therefore, all product must be brought in and stored onsite. No Deep Fat Frying is allowed. All signage, menu and marketing blurb must be provided in advance and pre-approved by Kildare Village in advance of residency. We also suggest you supply us with logos, blurbs and other relevant info so that we can promote your brand across our social media accounts.